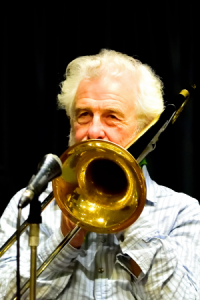 Eric was one of the founder members of Mart Rodger Manchester Jazz and played for several years with them and has recently returned to the trombone chair after playing with various bands in the meantime. Eric played in the Ged Hone Ragtime Band with Mart in the 60s, and in the early days he played with Manchester’s legendary Southside Stompers on Saturday nights at the Black Lion pub in Salford. Eric is a great blues singer and trombonist but is equally accomplished with traditional and swing numbers. He has accompanied many famous British and American top names, including Nat Gonella, George Chisholm, Big Bill Broonzy and Wild Bill Davison.